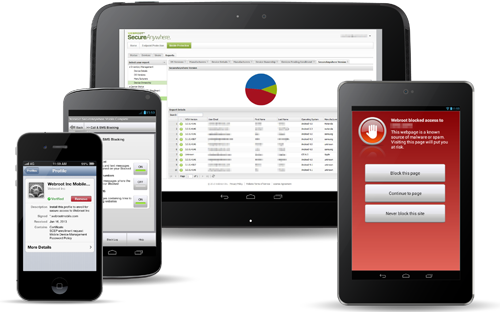 Webroot announced a new release of the Webroot SecureAnywhere Business—Mobile Protection suite. The new version adds some key features and capabilities and blurs the line between mobile security and mobile device management. One element that stands out from the rest, though, is Webroot’s new service to help IT admins understand the risk posed by installed apps. The new version of Webroot SecureAnywhere Business—Mobile Protection provides IT admins with device and group-level policies for both Android and iOS devices. Alerts are sent to the management console when a mobile device does not comply with the policy, giving IT admins an opportunity to address the situation. In this version, Webroot has extended the SecureWeb browsing protection for Android to apply to both the stock Android Web browser and Google Chrome. Perhaps the biggest news about the new release, though, is the Mobile App Reputation Service. Webroot has scanned more than 4.8 million Android and iOS apps and counting. While some apps are inherently malicious and can be identified as malware, there are many more apps out there that are not malware per se, yet still do suspicious or insidious things. Webroot analyzes the permissions requested by apps and the actual behavior of the apps to assign a score that helps IT admins determine the level of risk posed. Another key improvement in the new version is the use of cloud scanning. This gives Webroot protection a smaller footprint on the mobile device endpoints, and it consumes fewer processor or memory resources. The biggest benefit, perhaps—especially for a mobile device—is that it uses less power on the device so battery life is extended. Mobile device management and security are rapidly growing priorities for most companies. A recent survey commissioned by Webroot found that three out of four companies have embraced BYOD on some level. More than 80 percent believe that mobile devices introduce high security risk, and nearly two-thirds report a significant increase in demand for help desk support to manage security issues for smartphones and tablets. That’s where something like Webroot SecureAnywhere Business—Mobile Protection comes in. Merging mobile security and mobile device management into one simple tool makes it easier for IT to manage and protect mobile devices, and mobile devices that are better managed and protected are less likely to require support.Increased demand for support has a cascade effect that impacts other areas of the company. According to the survey, as much as 36 percent of a help desk technician’s time is spent resolving issues for mobile devices, and six out of 10 respondents were forced to hire additional IT resources to manage mobile security. Mobile device management and security has direct costs as well as collateral costs in terms of the resources available to address other areas of IT. The current version of SecureAnywhere Business—Mobile Protection, which supports both iOS and Android, is available online from Webroot. Pricing varies by volume and duration, but a one-year license starts around $25. The new edition will be released in November, and existing customers will receive this new product version for free.